Gen Z consumers are the largest user demographic for a plethora of mobile payment options and money-saving tools, and the rest of us could benefit from adopting some of the younger generation’s budget-conscious ways. For most Gen Z consumers — 81 percent, according to the American Psychological Association — money is a major source of stress. That has made them more interested in saving money, not to mention more savvy about how to do it. As a group, Gen Z came of age watching parents and older siblings take on massive amounts of debt while struggling to find stable, well-paying jobs. At the same time, the global recession hung over their childhoods. Given these formative experiences, it’s no wonder that money matters are so central for Gen Z. The thing is, Gen Zers are actually doing something about it: Eighty-nine percent report feeling empowered by planning for their financial futures. That kind of research and financial planning carries over into everyday spending, where Gen Z consumers are the largest user demographic for a plethora of mobile payment options and money-saving tools. From millennials to baby boomers, the rest of us could benefit from adopting some of the younger generation’s budget-conscious ways. Despite Americans’ rising accumulated debt levels— 80 percent have some form of debt — Gen Zers are maintaining a hopeful outlook. More than 80 percent of Gen Z consumers expect to purchase a home within five years, while only 21 percent of millennials can say the same. Gen Z’s eldest members are just entering the workforce, and they value high-paying jobs and are attracted to companies with hefty 401(k) benefits, student loan repayment plans, and free or discounted food at work. 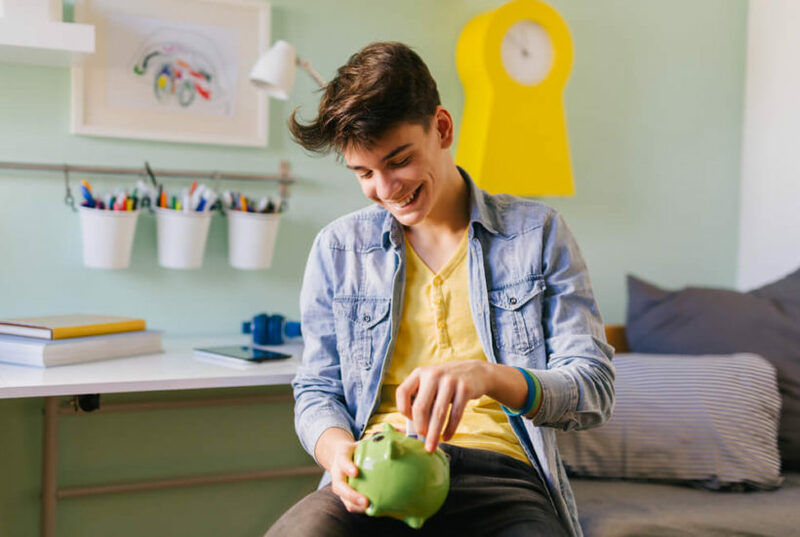 Their financial education started early: Twenty-one percent of this generation had savings accounts before they were 10 years old, and 12 percent of them have already started saving for retirement, according to the Center for Generational Kinetics. Gone are the days of fumbling in a wallet, looking for the right loyalty card for the right store. Today, grocery stores, retailers, and restaurants have transitioned their cards to apps that consumers can access online or through their phones. These free loyalty programs offer perks for shopping with the card, such as free Wi-Fi access, discounted dining, cash back, free items, and coupons. And frequent customers get even bigger perks: At Sephora, for example, the highest-tier or loyalty members are rewarded with free two-day shipping. While older generations might be wary of mobile payment options like digital wallets, Generation Z is composed of digital natives. They’re already more likely to use mobile banking than other generations, and digital wallets are the natural next step. These mobile wallets keep the user’s money and identities safe using encryption and tokenization so that transactions stay secure. At the same time, they allow people to leave their wallets at home or feel secure if they forget a card. And some digital wallets offer promotions, cash back, and other perks. Who has time to sit down and cut out all of the coupons that arrive in the Sunday paper anymore? Instead, consumers now have access to digital coupons, so they don’t have to battle with a bulky wallet or coupon organizer that they’ll inevitably leave at home by accident. Plus, with an app like SnipSnap, people can even digitize paper coupons. Considering that Gen Z is twice as likely to use mobile devices for shopping as their millennial counterparts, access to mobile coupon apps like RetailMeNot or Shopkick simplify their money-saving tactics. Using a digital rebate app allows customers to save money after the purchase, rather than saving instantly with a coupon. And today, users no longer have to cut out a bar code or fill out a rebate form that they then have to mail in and wait six to eight weeks for an answer. Rebate apps like Ebates, Swagbucks, and BeFrugal all have consumers stop at the app first and then the app automatically routes them to the retailer. The purchases are tracked via the app, and people get their cash back later. Another type of cash-back portal is a receipt-scanning app, such as Ibotta, Checkout 51, or SavingStar. These apps allow people to take photos of their receipts and gain cash back with their purchases. Gen Zers may be stressed about money, but they are doing everything they can to save for their futures. With more and more digital options popping up to alleviate the stress of saving, Gen Zers are showing us the way to achieve a more stable financial future. Elizabeth Mead is the chief marketing officer of CrayPay, a free app that drives mobile payment adoption by offering to instantly pay a portion of every purchase made. A seasoned, award-winning marketing strategist and certified project manager, Elizabeth brings a unique point of view and blended tactics gained from years of generating powerful results for her clients.